This post/video is long overdue, but I wanted to create a tutorial using the compressor before I reviewed it, which I recently did, my Gimme Some Sugar(pill), Baby! Tutorial. Stilazzi provided me with the No Strings Attached Compressor for review, it retails for $250, although, if you follow them on Twitter/Facebook, they occasionally have really great flash sales. The compressor is a diaphragm compressor and reminds me a little of a fish tank air pump on steroids. It is 2 1/8" H x 3 7/8" W x 4" D. The compressor has a range of approximately 4-26 PSI. It is a little noisy, just like other diaphragm compressors, and vibrates, but the little rubber legs are excellent at keeping the compressor in place. I've used an oil-less compressor before and it vibrated ALL OVER THE PLACE, which was very distracting. The website says that it is only meant to be used with gravity feed airbrushes. Decent pressure - For such a small compressor I was pleasantly surprised at the PSI range. Bleed valve - Most compressors of this size do not have variable pressure. Most are set at 10 PSI, which is really only meant for airbrushing foundation. Braided hose - The nylon braiding on the hose makes the hose more durable. I don't know how many times I've stepped on my other hose, but it's almost inevitable and the braiding helps to prevent damage. Battery - The battery makes this compressor truly portable and it convenient for touch ups when an outlet is not an option. While the pressure isn't as strong with the battery, it's still a nice option. Worldwide voltage - Can this compressor get any more portable?? Apparently! You can even take it across seas! 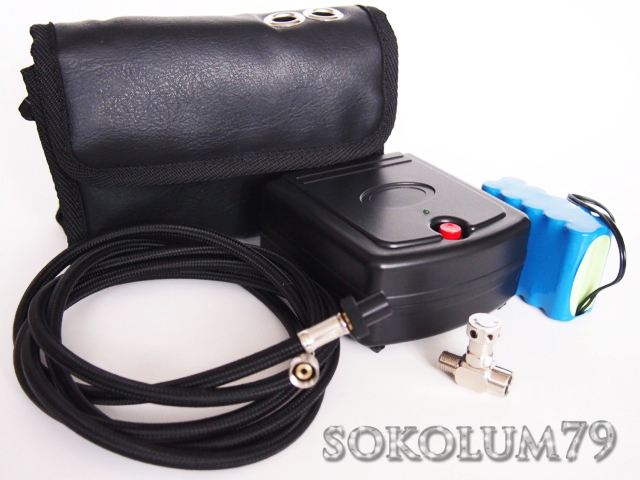 Carry case - The bad has compartments for your battery, compressor and another little doodad/adapter. This is excellent because you can then sling it over your shoulder or attach to your belt (if that suits your style) while using it if it's not convenient to place it on a counter or floor. Plastic hose attachment - the hose attachment to the compressor is made of plastic and I just worry that the threads will eventually strip and will no longer securely fasten to the compressor after regular use over time. No airbrush hanger - I wish there was a little hanger that you could snap onto the compressor. You need to buy and carry around a separate airbrush hanger or use a large bullnose clip as a hanger. 30 minute limit - The instructions say that you should only use it for 30 minutes at a time, I assume because it will over heat. So this isn't the compressor for large projects. I usually shut it off in between so it gives it a little cooling break anyway. Overall, this is a great portable sized compressor for anyone's kit. It's small enough to pack in your kit, it has a variety of uses due to the ability to adjust pressure and it can be used in a location where there are no outlets nearby. I provide a little overview of airbrushes and compressors in the following video.